Explore Shikhin further through these publications, then come join us and excavate! Strange, James F., Dennis E. Groh, and Thomas R. W. Longstaff, “The Location and Identification of Shikhin (Part 1),” IEJ 44 (1994): 216-27. Strange, James F., Dennis E. Groh, and Thomas R. W. Longstaff, “The Location and Identification of Shikhin (Part 2),” IEJ 45 (1995): 171-187. Strange, James Riley. “Shihin, Survey.” HA-ESI 124 (2012). Strange, James Riley. “Shihin – 2012.” HA-ESI 128 (2016). Strange, James Riley. “Kefar Shikhin.” Pages 88–108 in David A. Fiensy and James Riley Strange, eds. Galilee in the Late Second Temple and Mishnaic Periods, Volume 2: Archaeological Record from Galilean Cities, Towns and Villages. Minneapolis: Augsburg Fortress Press, 2015. 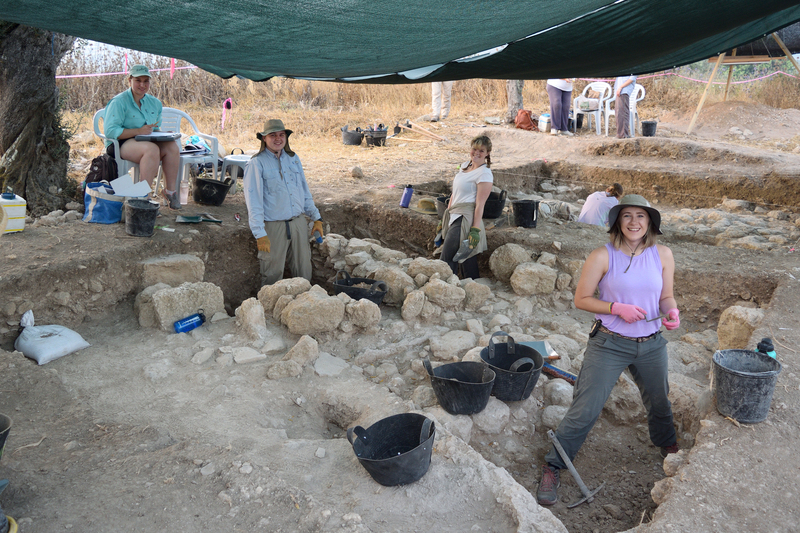 Strange, James Riley and Mordechai Aviam, “Shiḥin Excavation Project: Oil Lamp Production at Ancient Shiḥin.” Strata 35 (2017): 63–99. Strange, James Riley, “Shikhin lamp kiln.” The Levantine Ceramics Project. Shapiro, Anastasia. “A Petrographic Study of Roman Ceramic Oil Lamps.” Strata 35 (2017): 101-14. Strange, James F., Thomas R. W. Longstaff, Dennis E. Groh, and James Riley Strange, “The Shikhin Excavation Project Manual for Area Supervisors.” Revised 2018. Publications relating to Shikhin and its pottery production and distribution by D. Adan-Bayewitz and colleagues; November 2012. I.23 in 2018. L to R: Rachel Stivers-Bender, Bryant Moore, Janie Foncea, Bayley Sharp. Photo by Steven Meigs. 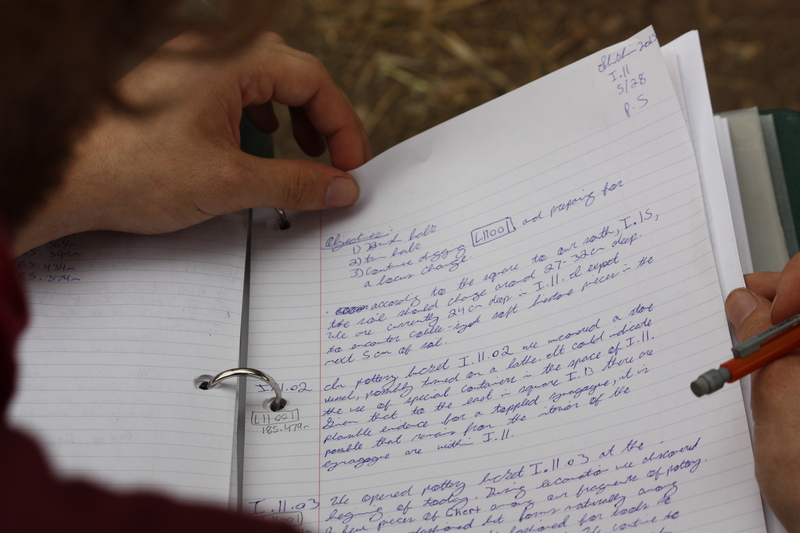 Daily notes for I.11, 2015. Photo by Penny Long Marler. 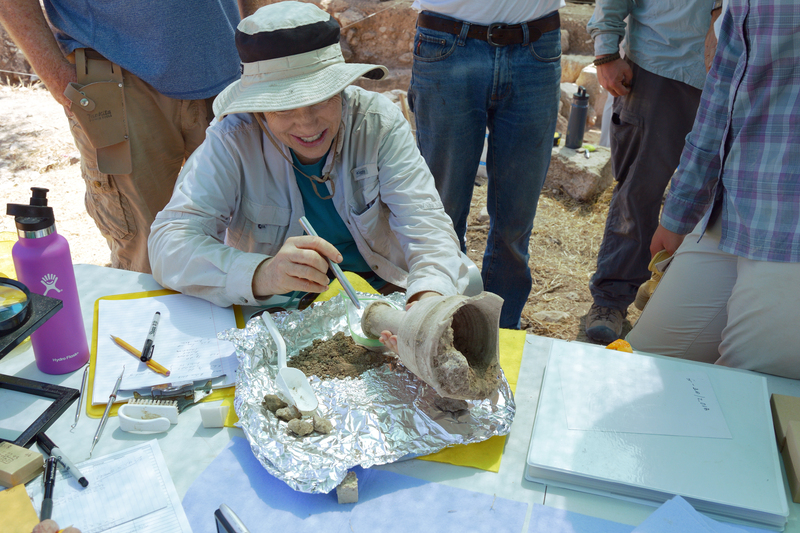 Dr. Betsy Dobbins, 2018, extracting soil from the funnel-shaped vessel of I.20. Photo by Steven Meigs. The crew of I.24 in 2018. 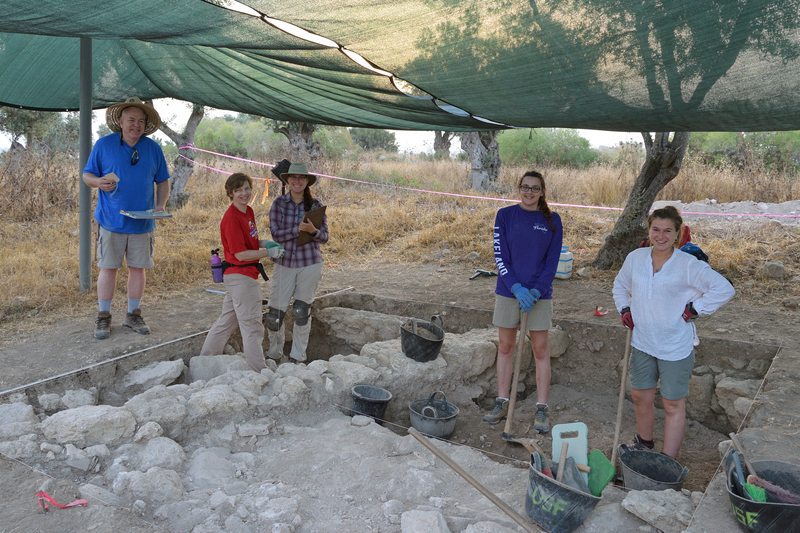 L to R: James Dobbins, Roberto Rosa, Sarah Burdick, Michaela Sawyer, Teryn Gilbertson. Photo by Steven Meigs. 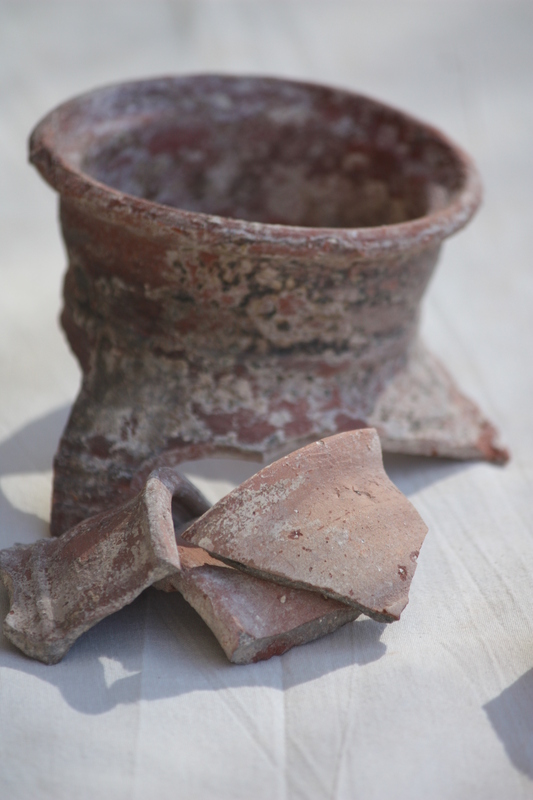 Jars at pottery reading on the roof of the Galilee Hotel, 2015. Photo by Penny Long Marler. The miqveh crew, 2015. 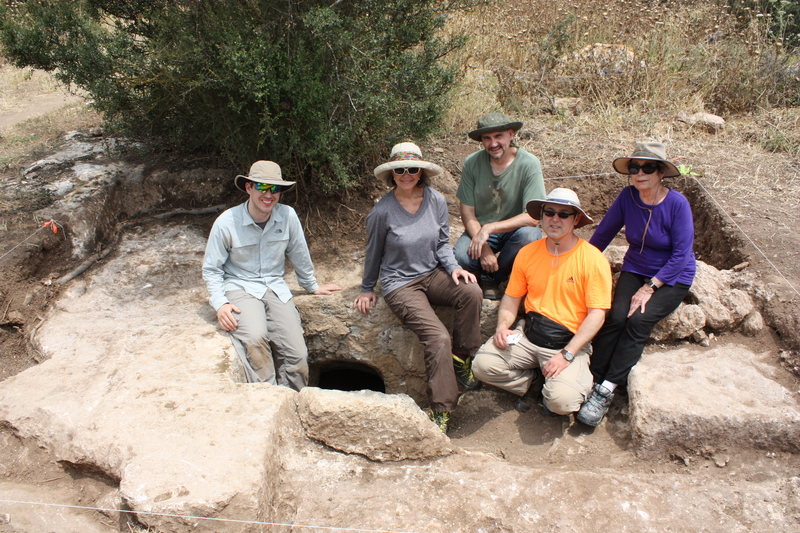 L to R: Stetson Pevear, Penny Long Marler, Randy O’Neill, Tom Blanton, Kay Clements. Photo by James Riley Strange. 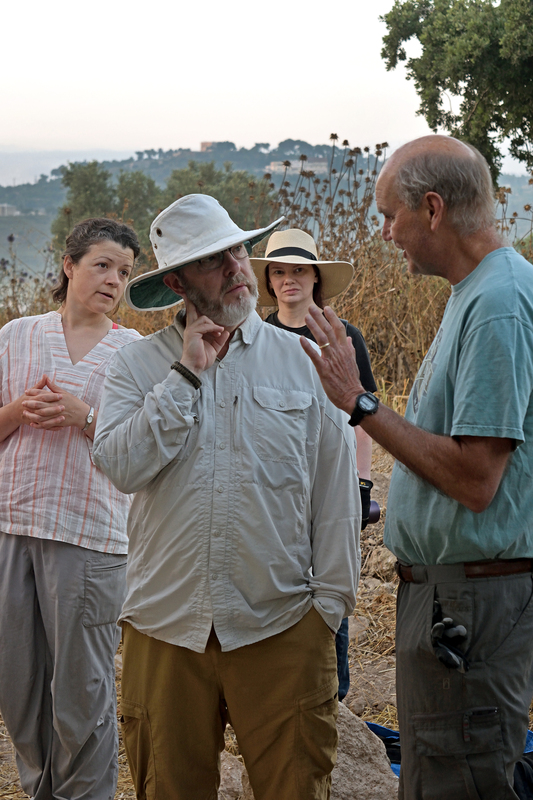 Tom McCollough (R), James Strange (L), Sarah Burdick (back R), Jenifer Elam (back L). Photo by Steven Meigs. 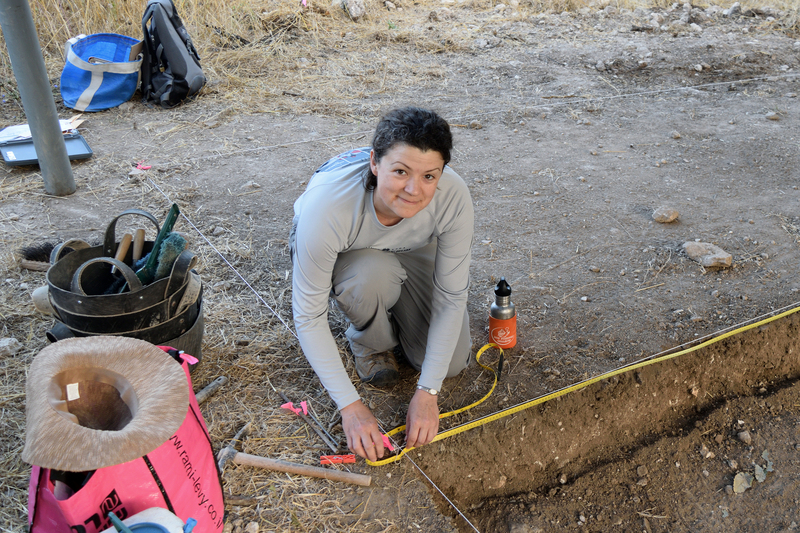 Architect Jen Elam strings up a datum line. Pottery reading on the roof of the Galilee Hotel, 2015. 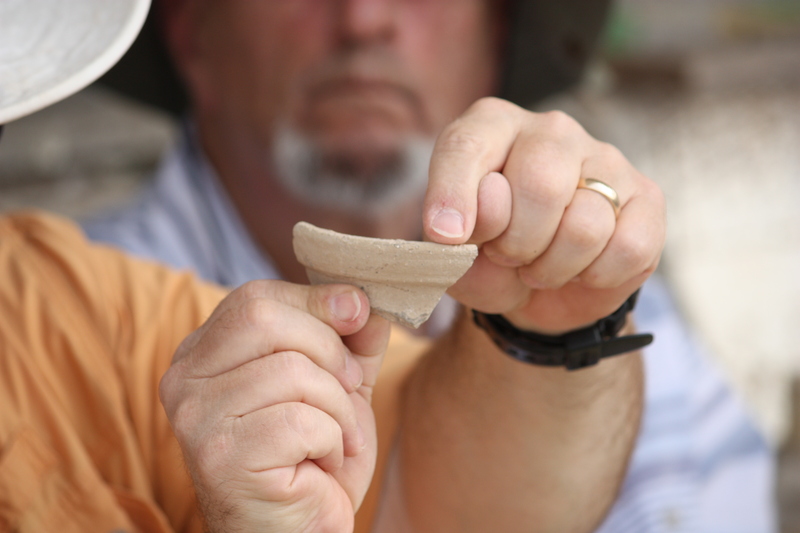 Holding the sherd: James Riley Strange; in the background: Denny Groh. Photo by Penny Long Marler. 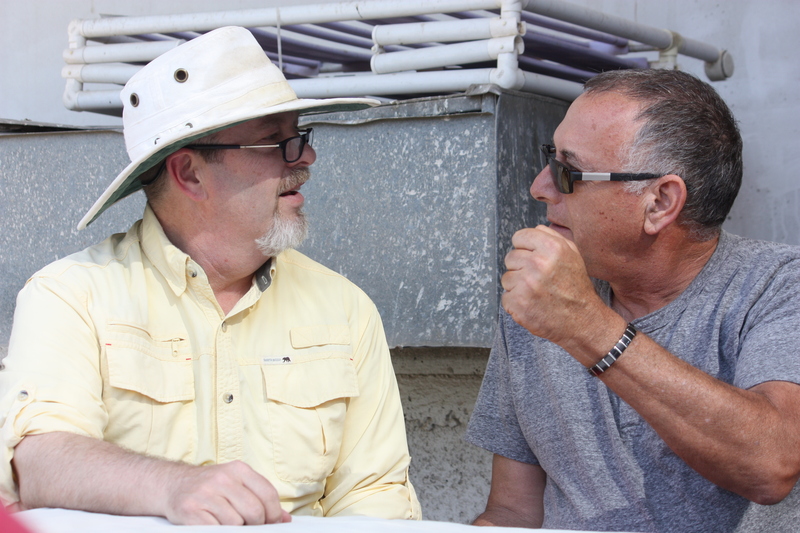 L to R: James Riley Strange and Motti Aviam at pottery reading on the roof of the Galilee Hotel, 2015. Photo by Penny Long Marler. 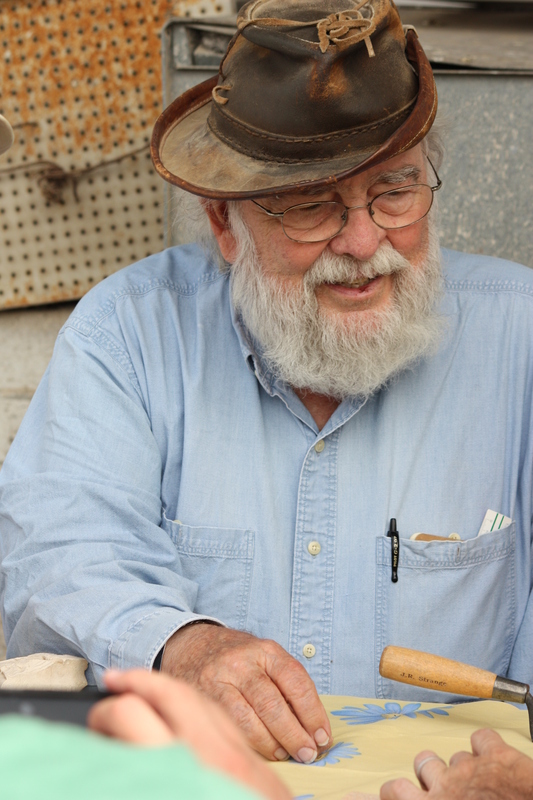 Abuna (James F. Strange) at pottery reading, 2015. Photo by Penny Long Marler. 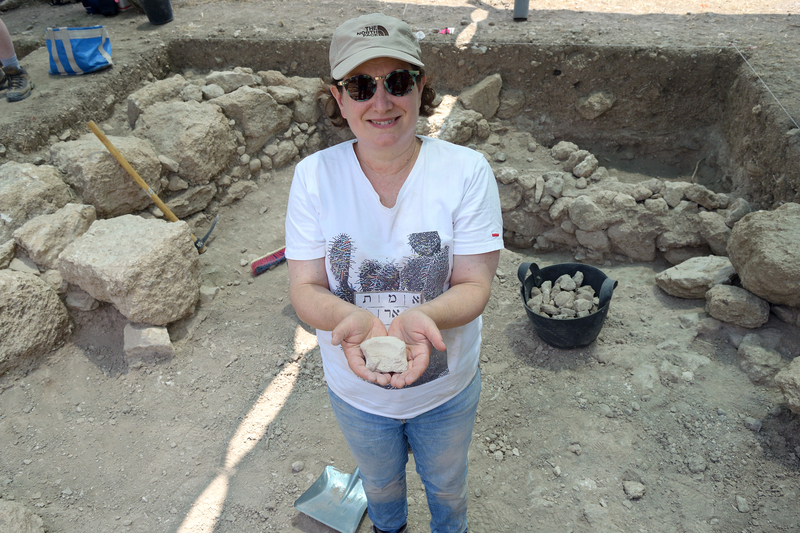 Toby Klein in I.21, 2018, holding a fragment of a lamp mold. Photo by Steven Meigs. I.20 in 2018. 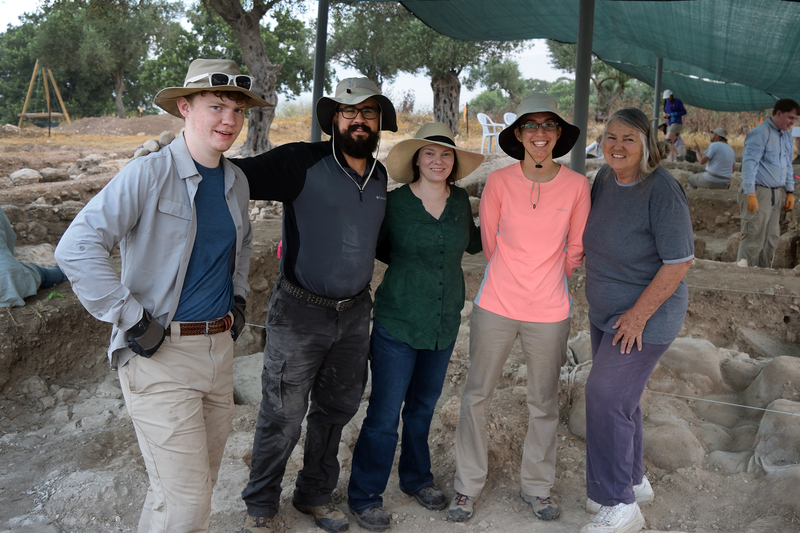 L to R: Carl Savage, Betsy Dobbins, Kristin Dantzler, Anna Erekson, and Fiona Lamon. Photo by Steven Meigs.